Alagarkoil is one of the important Vaishnava temples in Tamilnadu. It stand close under the southern end of the hill called Alagar Malai or Thirumalirumcholai Malai which runs about 15 miles from east to west. Alagar Malai is about 12 miles north east of Madurai city. Alagarkopil temple is situated 888 feet above se level and lies on latitutde 10.5 and longitude 78.14. Alagarkoil temple is situated at the foot hills of AlagarMalai. The temple Lord Alagar is facing east. It is surrounded by two fortified walls. As many as 6 Azhvaars have showered praise on the Lord at Thirumaaliruncholai, popularly known as Azhagar Koil with over a 100 beautiful Paasurams. This temple dates back to the times of Kalai Thunga Pandya and hence is said to be over 5000 years old. In centuries gone by, the direction to this place was identified as being 150 kms South of Cauvery and about 150 kms East of Palani Hills. 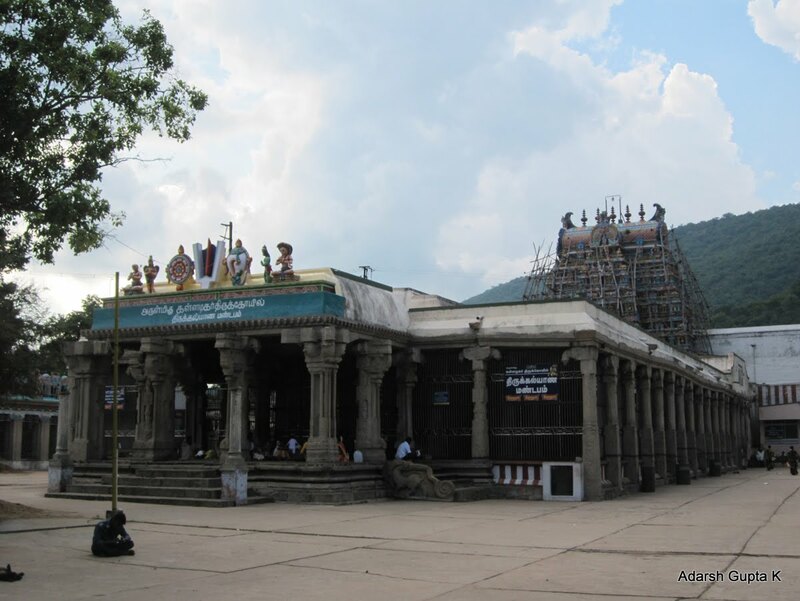 Situated at the foot of the Azhagar hills, that runs almost 15 kms in width and over a 1000 feet in height, Azhagar Koil is about 20kms North of Madurai. Frequent buses ply between Madurai and Azhagar Koil. One can also take an auto to this temple from Madurai Railway Station. The road has been well laid out and one can reach Azhagar Koil in about 30-45 minutes. A 4 km walk up the Azhagar hills (dense terrain) will take one to Silambaaru water falls (Nupoora Gangai), where one can have a bath in the sacred water. There is also a road route available now, up the hill. It is believed that drops of sacred water fell at this place when Brahmma was washing Lord Vishnu’s feet after his Trivikrama Avataar. And that these drops spread as River Nupoora Gangai. To this day, the sacred water from Silambaru is used for the daily poojas. Legend has it that one who has the sacred water at Azhagar Koil will be cleansed of all sins. Malaiyath Thuvaja Pandya, one of the earliest of the Pandya kings led the construction/renovation of this temple. Following him, several Pandya Kings are said to have built the fort structure as well as maintained and renovated the Azhagar Koil. 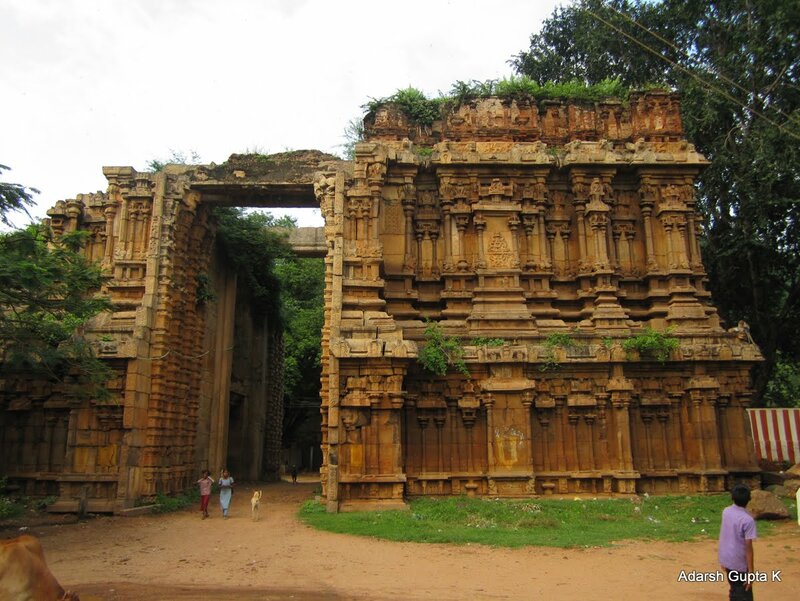 Chozha, Vijayanagara and Nayak rulers are also said to have contributed to this temple. Krishnadeva Raaya, whose intent it was to build huge temple towers at Vaishnavaite temples, also started the construction of a big temple tower at Azhagar Koil. As with sevaral other temple towers, his defeat left this tower too unfinished. The temple tower is called Raya Gopuram or Mottai Gopuram (having remained unfinished). Every year in the Tamil month of Chitirai, Azhagar is taken on his Garuda Vaahanam on a 20 km procession. He is said to go to the Vaigai in Madurai to provide Moksham to Mandaka MahaRishi. During this trip, he stops at different places along the way, with the Maduraites welcoming him into the city. On the way to the Vaigai River, KallAzhagar makes an important stop at Thallaakulam Perumal koil to collect the garland sent by Andaal of Srivilliputhur. Only after wearing this, does Azhagar get into the Vaigai River. 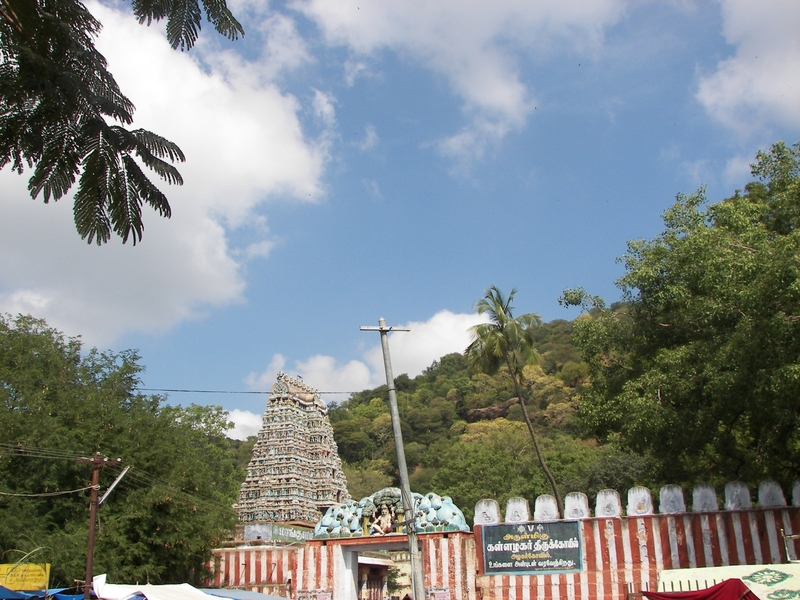 During the Aadi Thiruvadi Pooram festival, marking the birthday of Andaal, Lord Azhagar sends his attire to Srivilliputhur as a ‘return gesture’ to her. In course of time, Thirumalai Naayakar, the then ruler of the Pandya Kingdom decided to combine this festival with the Meenakshi Amman festival to make it the biggest festival of Madurai. 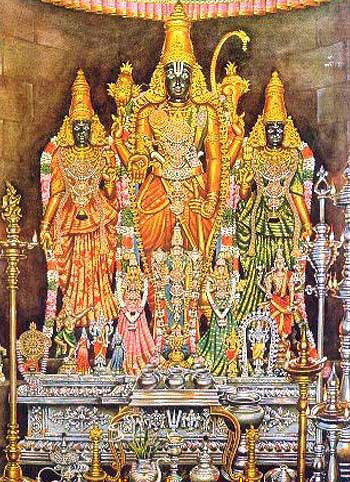 The belief is that KallAzhagar makes it to Madurai to witness the wedding of his sister Meenakshi(Amman). This is yet another case of the Unity between Saivites and Vaishnavites. Once there was an attempt to take away the idol of KallAzhagar. A priest at this temple put together a team and captured the 18 men who had come there to steal the idol. These 18 men were so lured by the beauty of Azhagar that they prayed to the Lord and requested that they stay here for ever. It is believed that each of these 18 men have taken a step each and now reside in the 18 steps of the temple at the main Eastern entrance. Realising their mistake, they sought to act as security guards of the Lord and solve any issues relating to the people. Hence, KaruppannaSwamy almost acts as a court to solve all issues in this area and is said to provide a fair judgment for those who believe in him. As a mark of this event, there is an image of ‘Karuppanna Swamy’ (the representative of these 18 men) at the main entrance. This main Eastern Entrance remains closed through the year except for 9 days in the Tamil month of Aadi and one can get inside the temple through the North East entrance. Every night, during the pooja time, the flowers adorned by the Lord is brought to Karuppana Swamy. 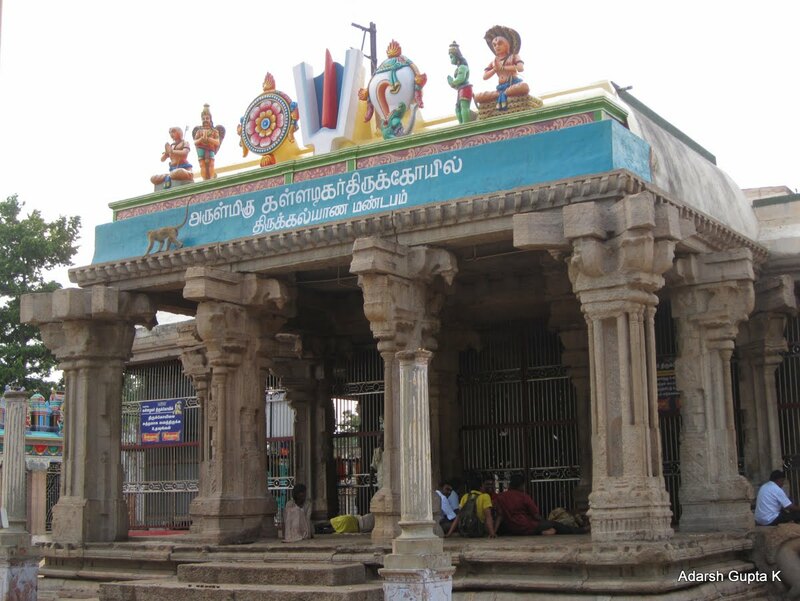 Andaal and her father PeriAzhvaar are said to have come here from Srivilliputhur and legend has it that Lord Ranganatha of Srirangam appeared before Andaal as Azhagar and married her. Andaal who had promised to provide Azhagar with 100 pots of sweet morsel and butter could not do so as she merged with Lord Ranganatha. Much later, Ramanuja fulfilled her promise by providing the Lord with the morsel and butter. As a thanking gesture, Andaal is said to have called him ‘Annan’, as a result of which Ramanuja came to be called ‘Kovil Annan’. The temple is open from 06:00 a.m. to 12:30 p.m. and from 03:30 p.m. to 08:00 p.m. The temple is situated in Madurai district of Tamilnadu. City bus service is available from Madurai, Natham, Melur and Vadipatti. Bus No. 844,845.